Britain's newborn princess has been named Charlotte Elizabeth Diana — seen as a tribute to Prince William's parents and grandmother. The princess is the second child of William and his wife Kate, the Duchess of Cambridge. The baby will be known as Her Royal Highness Princess Charlotte of Cambridge, royal officials said Monday. 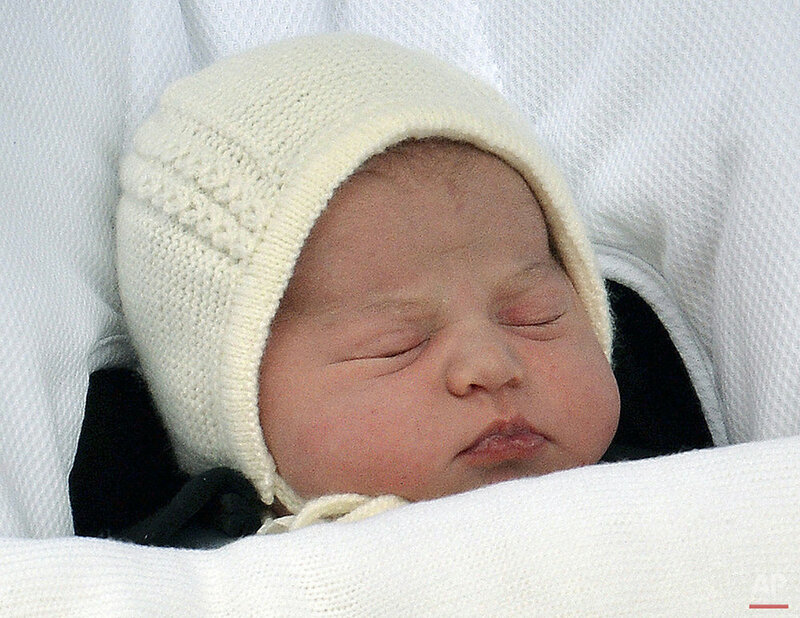 Charlotte, the feminine form of Charles, appears to be a nod to the newborn's grandfather, Prince Charles. The middle names honor Queen Elizabeth II, the infant's 89-year-old great-grandmother, and the late Princess Diana, William's mother. The princess is fourth in line to the throne after Charles, William and her older brother Prince George. William and Kate introduced the baby princess to the world Saturday evening, just 12 hours after Kate checked into a London hospital to give birth. The baby weighed in at 8 pounds, 3 ounces (3.7 kilograms). Charles Spencer, Diana's brother, was among the first to react on Twitter. "Perfect names. My 2-year old Charlotte Diana will be thrilled at cousinly name-sharing," he tweeted. Earlier Monday, Westminster Abbey's bells pealed and gun salutes were fired across London in honor of the newborn princess. In a display of traditional pageantry, dozens of deafening volleys were fired from Hyde Park and the Tower of London to mark the occasion. Bookmakers had taken huge amounts of bets on the name, and Charlotte had been a favorite choice, a front-runner alongside other guesses like Alice and Victoria. "Charlotte was the hot tip over the weekend," Ladbrokes spokeswoman Jessica Bridge said. "We may have lost a fortune, but we're paying out with a smile and wish the duke and duchess all the best." Another bookmaker, William Hill, said they were relieved because their top bet had been Alice. Spokesman Rupert Adams said 5,096 punters correctly guessed the name, and in total they would pay out just over 100,000 pounds ($151,100) in the name market. Royals traditionally look to their family tree for name ideas, and Britain's royal history has seen several Charlottes. Queen Charlotte, the wife of George III, was a keen botanist and founded London's Kew Gardens. Born in 1744, the queen had 15 children. 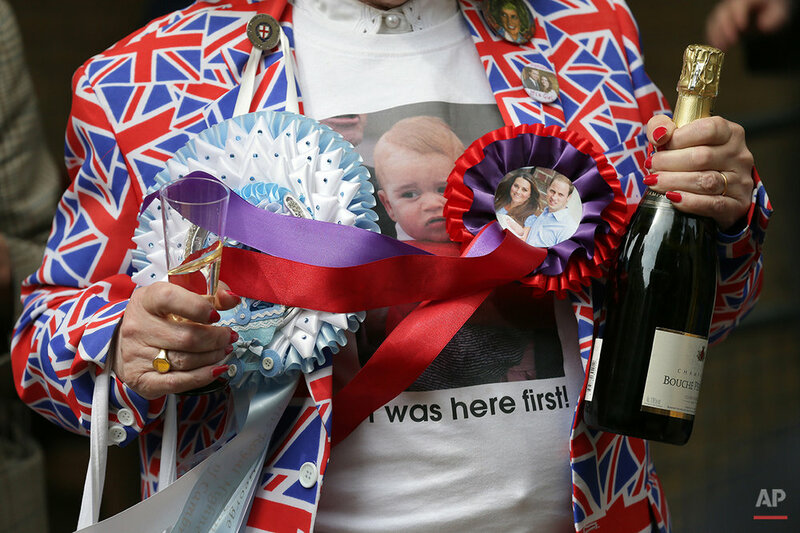 Below is a collection of images from The Associated Press' coverage surrounding Britain's newborn princess.